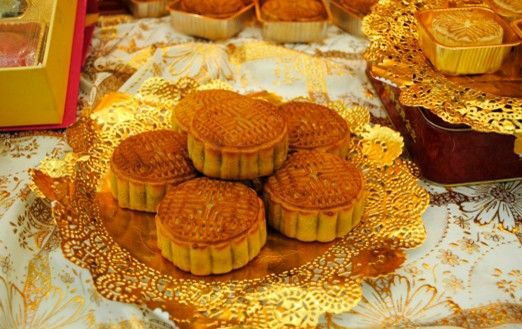 Mooncake, a traditional Chinese pastries, usually are made to celebrate the Moon Festival when all the family members will gather together to share their happiness. Mooncake have various tastes. Today, I would like to share one of Mooncake recipes with you. We need to make some preparation for materials firstly. Then, we can move to specific steps. (1) Make the mooncake dough. Choose one bowl, mix the flour, milk powder, baking powder and salt together. (2) Whipping eggs and sugar beat together for up to 5 minutes. Pour in the melted butter, vanilla extract. (3) Tip the dough onto a floured surface and knead lightly. Once smooth, the dough is ready. (4) Make the filling. Mix the apricot jam, chopped dates, coconut and raisins together in a small bowl. (5) Preheat the oven to 375ºF/190ºC/Gas mark 5. (6) Press each dough piece into a 3-inch circle. When stretching the dough, make the edges thinner and the center thicker. (7) Add the filling into the middle of each circle. Gather the edges over to enclose the filling and pinch closed. Roll into a ball, then flatten. (8) Press each flattened circle in the mold to shape the mooncake. (9) Brush each mooncake with egg wash.
(10) Bake for 30 minutes or until the moon cakes turn golden brown. Hope you can succeed shen you try to make mooncake. Welcome to my blog ! Nice to meet all of you here. I am Betty and look forward to sharing intresesting moments with you! Author Enjoy your lifePosted on January 18, 2016 Categories Uncategorized1 Comment on Hi, everyone ! Enjoy your life Blog at WordPress.com.